Vienna is playing in the Champions League when it comes to international congresses: never before have congresses, corporate events and incentives induced as much economic impact, attracted so many participants or generated as many overnight stays as they did in 2018. Meeting participants account for one in eight overnights in the city, which was reason enough for the City of Vienna to express its gratitude to all of the city’s congress organizers. United European Gastroenterology (UEG) Executive Director Doris Möstl accepted an award on their behalf. Vienna’s meetings industry set new records across the board in 2018: its contribution to Austrian GDP increased once again, by 3%, to EUR 1.198 billion. 4,685 congresses, corporate events and incentives (up 15% on 2017) set a new all-time high, with around 631,000 meeting participants and more than 1.9 million overnight stays. Vienna’s meetings industry generates around 21,500 year-round jobs nationwide. These successful figures were reflected in the positive mood among the around 300 Viennese congress organizers who came to City Hall on April 4 for the award ceremony, which took place for the 30th time this year. 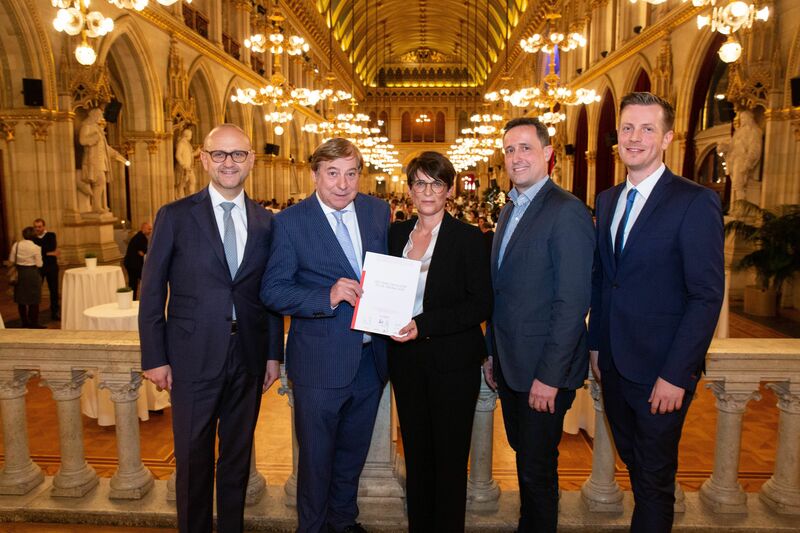 On behalf of those present, UEG Executive Director Doris Möstl accepted the award from Kurt Stürzenbecher, City Councilor and member of the Vienna State Parliament. Vienna Tourist Board Director of Tourism Norbert Kettner, head of the Vienna Economic Chamber’s Tourism and Leisure Industry Sector Markus Griessler, and Director of the Vienna Convention Bureau and Head of the Vienna Tourist Board’s Market Management Department Christian Woronka gave speeches in which they congratulated everyone involved and highlighted the importance of the meetings industry for the city. The UEG is an international medical non-profit organization whose member societies represent 30,000 specialists from every field of gastroenterology. It organizes various events including UEG Week ­­– the largest medical congress in Europe focusing on gastrointestinal diseases – and advanced medical training courses. Doris Möstl was instrumental in attracting UEG Week and its 13,000 participants to Vienna. Held alternately in Vienna and Barcelona between 2014 and 2019, UEG Week takes place annually. International congresses like this are particularly important for the economy: while this category represented just 21% of all meetings held in 2018, it accounted for 82% of the economic impact induced by the meetings industry in Vienna.